As he was walking by the Sea of Galilee, he saw two brothers, Simon who is called Peter, and his brother Andrew, casting a net into the sea; they were fishermen. He said to them, “Come after me, and I will make you fishers of men.” At once they left their nets and followed him. Just as Jesus called Simon Peter and Andrew, along with the others by name, and made them his Apostles, teaching them, forming them, and guiding them so as to follow his ways and his commandments, and one day be a teacher themselves for others, so too does Jesus continue to call young men and women to follow him today. Discerning one's vocation is truly a blessed time, but can also be a little scary if you try to do it alone, because many questions will arise. Rather than walking alone, you are encouraged to draw close to those whom, like you, or like someone you may know, have themselves felt that same call of God and answered it. 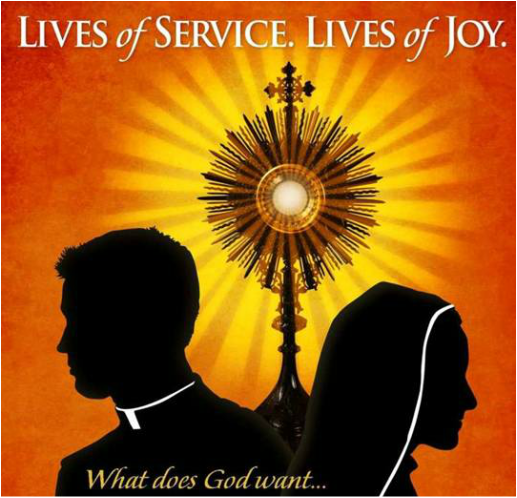 If you or someone you know is interested in discerning a vocation to the Priesthood, Permanent Deaconate, Religious or Consecrated Life, let them know that they are not alone and that we are here to help them and walk with them on this very special journey.